A man police believe is responsible for a series of home burglaries in Murrieta was arrested on Friday, Feb. 20 and is being held on $1 million bail on burglary and drug charges. 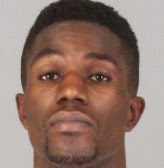 Byron Wilson, 25, of Los Angeles was taken into custody during a traffic stop near California Oaks Road and Jackson Avenue after police identified his vehicle as the one involved in a Feb. 18 burglary attempt on Shoshone Drive, according to a news release from the Murrieta Police Department. In that incident, reported at 1:12 p.m., the homeowner interrupted the burglary attempt after the suspect kicked in the front door. The homeowner got an image of a gold BMW convertible leaving the scene. The vehicle was located parked near the apartments off Sunflower Road on the night of Feb. 19. Detectives later tracked the vehicle and stopped the suspect. According to police, Wilson was involved in several completed burglaries on Malbec Court and Oxley Court. He was also involved in several burglary attempts on Shoshone Drive and Malbec Court. Wilson's preferred method of entry into all of these locations was by force. Police said Wilson is a product of AB109, signed into law in 2011. This legislation allows less serious felony offenders to remain out of custody on supervision (probation), while they would have previously been eligible for state prison. Because Wilson an AB109 offender, his person, vehicle and residence was searched by detectives following the arrest. Wilson was found to be in possession of a burglary tool and cocaine, as well as property taken from the completed burglaries on Malbec and Oxley. All stolen property has since been returned to those victims. He is being held on charges of burglary, possession of a burglary tool, grand theft and possession for sales of cocaine. Detective Whiddon Steve requests any citizens living in the neighborhoods surrounding Cal Oaks Sports Park that believe their residence was tampered with and/or entered in the last two weeks contact his desk. The police department is looking for any victims that may not have already reported these break-ins to the PD. Detective Whiddon can be reached at his desk at 951-461-6393.